BRCA1 plays an essential role in maintaining genome stability. Inherited BRCA1 germline mutation (BRCA1+) is a determined genetic predisposition leading to high risk of breast cancer. While BRCA1+ induces breast cancer by causing genome instability, most of the knowledge is known about somatic genome instability in breast cancer cells but not germline genome instability. Using the exome-sequencing method, we analyzed the genomes of blood cells in a typical BRCA1+ breast cancer family with an exon 13-duplicated founder mutation, including six breast cancer-affected and two breast cancer unaffected members. We identified 23 deleterious mutations in the breast cancer-affected family members, which are absent in the unaffected members. Multiple mutations damaged functionally important and breast cancer-related genes, including transcriptional factor BPTF and FOXP1, ubiquitin ligase CUL4B, phosphorylase kinase PHKG2, and nuclear receptor activator SRA1. Analysis of the mutations between the mothers and daughters shows that most mutations were germline mutation inherited from the ancestor(s) while only a few were somatic mutation generated de novo. Our study indicates that BRCA1+ can cause genome instability with both germline and somatic mutations in non-breast cells. BRCA1 maintains genome stability through repairing double-strand DNA damage and other mechanisms . The BRCA1 germline mutation (BRCA1+) is a well-known genetic predisposition for inherited breast cancer [2–4]. Women who inherited BRCA1+ have a 60-80% risk of developing breast cancer by the age of 70 . It is believed that BRCA1+ leads to breast cancer by causing genome instability [6, 7]. Indeed, many efforts have been made to determine the nature of BRCA1+ induced genome instability. Cytogenetic studies in BRCA1+ familial breast cancer showed the losses of 2q, 4p, 4q, 5q, and 12q ; analysis of a breast cancer-derived cell line HCC1937 showed aneuploidy, loss of p53 and PTEN, and loss of heterozygosity (LOH) at multiple loci ; analysis in BRCA1+ basal-like breast cancer identified the losses of the regions containing RB1, INPP4B, RAD17, RAD50, and RAP80 , and large-scale chromosomal breakage, copy number loss and LOH [11, 12]. Of the three distinct classes of “simple”, “amplifier” and “complex” DNA copy-number alterations defined for breast cancer, BRCA1+ breast cancer fits within the “complex” class . Conditional Brca1 knockout in the mouse model results in breast tumor formation after a long latency, changes in the centrosomes, chromosomal gain and loss in specific segments orthologous to the genetic loci mutated in human breast cancer [14–16]. Data from these studies indicate that many types of genetic defects in the genome are caused by BRCA1+ induced genome instability. A fundamental question remains to be answered, that is, whether BRCA1+ could cause germline genome instability. Most BRCA1 mutations are founder mutations originated from the ancestor of the affected family passing through multiple generations. While BRCA1+ is inherited at the beginning of fertilization of the BRCA1+ carriers, breast cancer will only develop in the reproductive age. Between fertilization and reproductive age, are there any genetic changes in BRCA1+ carrier genome besides the cancer-targeted breast cell genome, considering the essential roles of BRCA1 in maintaining genome stability? Nearly all genome instability studies in human breast cancer have been focused on breast cancer tissue where germline changes are considered as normal genome variations and disregarded. Therefore, the information derived from previous studies reflects mainly the somatic genome instability in breast cancer cells. We hypothesize that the loss of BRCA1 function could cause genome instability in non-breast cancer cells. In this study, we used exome sequencing method to analyze the entire coding genes in the genomes of blood cells in a typical BRCA1+ breast cancer family. Our study identified multiple recurrent germline and somatic mutations in the genomes of blood cells, highlighting that BRCA1+ can cause genome instability in both breast cancer cells and non-breast cancer cells. The breast cancer family used in this study contains a heterozygous founder mutation, a 6 kb frameshift duplication comprising exon 13 of BRCA1 (ins 6 kb exon13-ter1460) that originated from northern British ancestors [17, 18]. This mutation is regarded as one of the frequent founder mutations for BRCA1 mutation testing. Eight family members across two generations were selected for exome sequencing analysis. Of those, six females were diagnosed with breast cancer at the age of 62 (#1), 53 (#2), 35 (#4), 35 (#5), 36 (#6), and 35 years old (#7), and each had inherited the founder mutation. Two members were unaffected at the age of 65 (#3, female) and 45 (#8, male), neither inherited the mutation. #9 and #10 (fathers) were used to remove the variants transmitted to their daughters #5, #6 and #7, accordingly (Figure 1). The use of the samples for the study was approved by the Institutional Review Boards of Creighton University and University of Nebraska Medical Center. All subjects signed the consent form to participate in cancer genetic study and to publish the details. Pedigree of the BRCA1 + family used in the study. Eight members of this family were sequenced by exome sequencing, of which #1 (62y), #2 (53y), #4 (35y), #5 (35y), #6 (36y), #7 (35y) are breast cancer-affected and #3 (65y) and #8 (45y) are breast cancer-unaffected members. All six affected members are BRCA1+ whereas the two unaffected members are not. #9 and #10 were used in validation to remove the variants transmitted from them to their daughters. Genomic DNA from blood cells of the selected individuals was used for this study. Exome library preparation, capture, and sequencing were performed following the Illumina exome sequencing procedures. NimbleGen SeqCap EZ human exome V2.0 kit was used for exome capture. Paired-end sequences (2x100) were collected in the Illumina HiSeq2000 sequencer. The exome data were deposited in NCBI (Accession number SRR949927). The exome sequences were mapped to the human genome reference sequence hg19 by Bowtie2 using the default parameters in paired mode . The resulting SAM files were converted to BAM files and the duplicates were removed using Picard (http://picard.sourceforge.net). The mapped reads were locally realigned using GATK RealignerTargetCreator. The base quality scores were recalibrated with BaseRecalibrator using dbSNP137 in the GATK resource bundles for hg19. VarScan 2  and GATK  were used for variant calling following the instructions. For VarScan 2, pileup data were generated from BAM files using Samtools  mpileup command (with –B parameter to disable BAQ computation), and the default parameters were used with the minimum read depth at 10, minimum base quality at 30; for GATK, UnifiedGenotyper was used for variant calling. BAM files were used for variant calling with GATK v4, release 2.0 with default parameter settings, including stand_call_conf = 30 and stand_emit_conf = 30, the minimum base quality score increased from 17 to 30 using dbSNP137. The variants called by VarScan 2 and GATK were annotated with ANNOVAR using the software provided databases of RefSeq, dbSNP137, 1000 Genomes  and ESP6500 from NHLBI Exome Sequencing Project (NHLBI GO Exome Sequencing Project, http://evs.gs.washington.edu/EVS/). The called variants were divided into known variants and novel variants. The known variants were further classified, based on their minor allele frequency (MAF) distribution in ESP6500 or 1000 Genome (≤0.001, and > 0.001). Those with MAF > 0.001 were removed as common normal variants. Those with MAF ≤ 0.001 and novel variants were further classified into synonymous, nonsynonymous, splicing change, stop gain, and stop loss. For the nonsynonymous variants, PolyPhen-2  and SIFT  programs were used to identify those with predicted deleterious effects as defined by PolyPhen-2 score [Probably damaging, 0.909-1, Possibly damaging 0.447 - 0.908, Benign 0–0.446 (HumVar score)], and SIFT score covered by ANNOVAR LJB2 (Damaging < 0.05, Tolerant ≥ 0.05) . The final variants include the novel variants and the rare variants (MAF ≤ 0.001) with deleterious effect, splicing alteration, and stop gain/loss. The fragile sites used for the analysis were based on the reference . Sanger sequencing was used to validate the variants called by mapping analysis. Sense and antisense primers were designed for each candidate by Primer3 (http://frodo.wi.mit.edu/primer3/). PCR was performed with the same DNA used in exome sequencing (20 ng/reaction), sense and antisense primers (10 pmol), and Taq polymerase (1.25 unit, Promega) at the conditions of denaturing at 95°C 7 minutes, 38 cycles at 95°C 30 seconds, 56°C 30 seconds, 72°C 30 seconds, final extension at 72°C 7 minutes. The amplified DNA products were subject to Big-Dye sequencing reactions. Sequences were collected in a ABI3730 sequencer, and examined by using CLC Genomics Workbench 6.5 program (CLCbio, Cambridge, Massachusetts, USA) to validate the called variants. We collected paired-end (2x100) exome sequences at 119x coverage on average for each member. We used the following steps for sequence mapping and variant call. 1) Sequences were processed and variants were called by both VarScan 2 and GATK; 2) The variants shared between the affected members and the unaffected members were removed; 3) Nonsynonymous variants were identified; 4) Deleterious variants leading to loss-of-function of the affected genes were predicted by either PolyPhen-2  or SIFT  or both programs. 5) The variants shared between the father (#9, #10) and their daughters (#5, #6, #7) were removed upon Sanger sequencing validation; 6) All the remaining variants were validated by Sanger sequencing to confirm that each variant is a real germline mutation present only in the breast cancer-affected members. Through these processes, we identified 23 germline mutations in breast cancer-affected members in this family, of which 21 are novel mutations and 2 are rare mutations (rs143160739, rs370052455) with minor allele frequency (MAF) <0.001 (Table 1). The total frequency of the 23 mutations is 54, including 12 (52%) mutations present between 2 to 6 members, and 11 (48%) mutations present only in a single individual. On average, 9.2 mutations (54/6) are present in each breast cancer-affected member. Of the 23 mutations, 12 were shared in at least two of the three BRCA1+ breast cancer-affected sisters (#1, #2, #4), 2 were present only in sister #2 (Table 2A). We compared the variants between mother and daughter pairs. Pair 1 includes mother (#2) and two daughters (#5, #6), all are BRCA1+ and affected with breast cancer at 53, 36 and 36 years old respectively; Pair 2 includes mother (#4) and daughter (#7), both are BRCA1+ and were affected with breast cancer at 35 years old. Because the variants shared between the father and the daughter(s) were eliminated, each mutation is firmly determined as either germline mutation inherited from the mother, or somatic mutation generated de novo in the daughter(s). Of the 23 mutations, 15 were germline mutations between the mother and the daughter(s) (9 in Pair 1, and 6 in Pair 2); 9 were de novo somatic mutation only in the daughter (#5). There was no de novo somatic mutation in the daughter (#6) in Pair 1 or the daughter (#7) in Pair 2 (Table 2B). 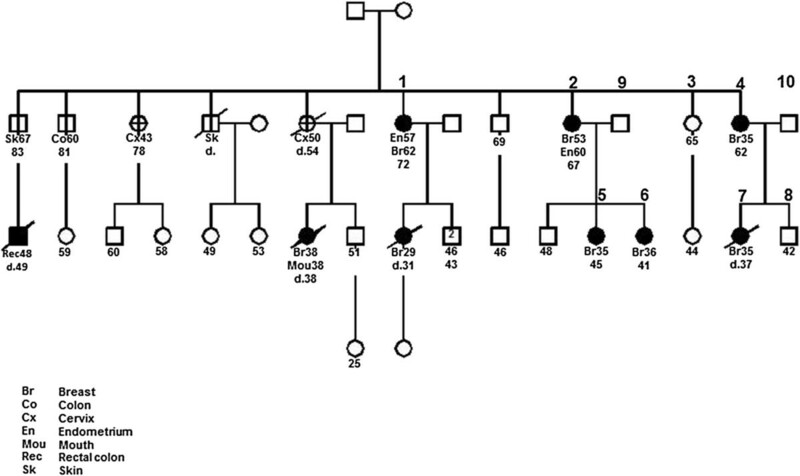 *Two mutations exist in ESP 6500 with MAF 0.000077, all others are novel mutations only detected in this family. D: probably damaging; P: possibly damaging; B: benign; T: tolerant. The 23 mutations are enriched in several chromosomes, such as chromosome 3 (TMPRSS7, FOXP1), chromosome 16 (LAT, PHKG2) and chromosome X (CLCN4, CUL4B, ZNF674). Except the mutations in ZNF304 and ZNF674, no mutations are located in the repetitive sequences of SINE, LINE, LTR, simple or satellite sequences. Fifteen mutations are located in the regions with known structural variations and 5 mutations in the chromosomal fragile sites of 4A, 11E, 2G, 11C, and 18A (Table 3). For the 23 mutations, the ratio of transition/transversion (Ti/Tv) is 1.6. However, the ratio increased to 3.0 (9/3) for the common mutations. In contrast, the ratio decreased to 0.8 (5/6) for the mutations present only in single individual. The ratio between common mutations and individual mutations is statistically different by Fisher exact test (p = 0.009, Table 4). BPTF is a bromodomain PHD finger transcription factor, involved in transcriptional regulation and chromatin remodeling . Copy number changes in BPTF are present in many types of cancer . CUL4B is an E3 ubiquitin ligase catalysing polyubiquitination for protein degradation . FOXP1 is a member of the forkhead box (FOX) transcription factor family, involving in regulation of tissue- and cell type-specific gene expression. Its expression is under the regulation of estrogen and it is known to play a role in breast cancer cell proliferation . GSTK1 (glutathione S-transferase kappa 1) is involved in cellular detoxification . LACRT (lacritin) is highly expressed in lacrimal glands. Copy number amplification of LACRT was observed in breast cancer . PHKG2 is a phosphorylase kinase. It is involved in liver glycogenesis. Mutations in this gene cause glycogen storage disease type 9C . SRA1 is a steroid receptor activator, involving in the regulation of many nuclear and non-nuclear receptors and associating with breast cancer . The mutation in this gene is also present in the member (#8), who is a male not affected with breast cancer. The Cancer Genome Atlas Network (TCGA) identified 56 somatically mutated genes from 510 breast cancer tissues, of which about 90% are sporadic breast cancer . Comparison between the 23 mutated genes in our study and the 56 mutated genes shows no overlap between the two sets of mutation-affected genes. The closest correlation is the mutations in the FOX family, in which FOXA1 is somatically mutated in sporadic breast cancer and FOXP1 is germline-mutated in the BRCA1+ family. Mutations in these two FOX genes are associated with breast cancer . Absence of overlapping mutations between the BRCA1+ genomes and sporadic breast cancer genomes suggests the different genetic basis between these two types of breast cancer. Searching the 23 mutations by gene name in the COSMIC database, which contain somatic mutation information for various types of human cancer, shows nineteen genes being present in COSMIC, however the mutations were at different position; searching by exact positions shows the presence of the same mutations for KCTD8 and CACNB3. KCTD8 is a component of potassium channel and CACNB3 is a subunit of calcium channel. The oncological roles of these two mutated genes in familial breast cancer remain to be elucidated. Tumorigenesis requires multiple genetic defects to transform a normal cell to a tumor cell [38, 39]. In familial breast cancer, germline mutations inherited from ancestors play important roles in cancer processes. BRCA1+ is the strongest germline predisposition for familial breast cancer. While it is widely accepted that BRCA1+ leads to breast cancer by causing genome instability, the detailed mechanism for how BRCA1+ causes genome instability remain to be determined. Our study shows the presence of mutations in blood cells from the BRCA1+ breast cancer family. By definition, only the mutations occurred shortly after fertilization can be germline mutation. Although blood cells are frequently used in solid tumor genetic study to represent germline genome, the mutations detected in blood cells in fact include both true germline mutations occurred during fertilization and somatic mutations occurred after fertilization. By combining the pedigree information, however, we can clearly distinguish the two types of mutations that those shared between generations (mothers and daughters) are the germline mutation, and those only presented in single individual (#2 daughter) are de novo somatic mutations. The number of germline mutations is much larger than the number of de novo somatic mutations, this is due to the fact that germline mutations are accumulated/inherited from multiple generations whereas somatic mutations are only present in individual generation. The results indicate that BRCA1+ can induce germline genome instability represented by the genome of blood cells. Can the small numbers of mutations be identified by chance? For the following reasons, we consider it unlikely: in the study, we applied a multi-step mapping pipeline in order to maximally differentiate germline mutations associated with cancer from abundant normal variants, including the filtration of normal variants using public variant databases of dbSNP, 1000 genomes and exome variation databases, the use of the aged, unaffected family members to remove private variants in the family, exclusion of the contribution of father’s germline mutation to the daughter in the trios, the focus only on the deleterious mutations causing non-synonymous mutations, splicing alternation and stop gain/loss, and the use of Sanger sequencing validation. It is also worth indicating that the functionally important mutations in cancer are in small numbers [40, 41]. The small number of mutations identified were likely generated by BRCA1+ directly or indirectly. Their roles could be promoting oncogenesis, or function as BRCA1+ modifiers to amplify the oncogenic function of BRCA1+. Our study focuses on the deleterious mutations at single-based level. Other types of genetic changes could also be present in BRCA1+ genome. For example, increased CNV in TP53 was shown to be present in Li-Fraumeni syndrome, a disease closely related with BRCA1+ familial breast cancer . It is well known that transition occurs at a higher rate than transversion mutations in cancer cells . Indeed, we observed a higher Ti/Tv ratio (3.0) than that in the normal genome (2.1) for the common mutations, implying that the germline genome instability also follows the same trend that found in somatic genome mutation. However, the ratio of Ti/Tv mutations in the individual mutations (0.8) is lower than that in the normal genome. Possible causes could be that the individual mutations tend to be random events, with less biological significance, or that the number of those mutations is too small for the comparison. Elimination of family-specific normal variants is a key to identify the true predispositive mutations in the cancer, as a normal human genome can have multiple genes mutated . Familial-specific normal variants cannot be removed solely by referring to the population-based variation databases, as many familial-specific normal variants are not included. The unaffected family members can serve as the closest control for this purpose. While this process could remove certain real mutations shared between the unaffected and affected members (low penentrant), and certain family-specific normal variants could still remain in the affected members (not present in the unaffected members), the mutations present only in the affected members are more likely to be associated with cancer than those shared between the affected and unaffected members. Referring to functional importance of the mutation-affected genes also helps to identify ture predispositive mutations. Because of the mutations we identified are present only in the cancer members, shared between multiple cancer-affected members in the disease family, and have functional relevance to cancer, they are most likely associated with breast cancer in the disease family. Our study shows the presence of genome instability in the genomes of non-breast cells in the BRCA1+ familial breast cancer family. The presence of germline mutations provides a potential source to identify genetic targets for early intervention of tumorogenesis process in BRCA1+ carriers long before tumor formation in breast cells, for which there are currently limited options besides preventive surgery. Fengxia Xiao, Yeong C Kim contributed equally to this work. The study was supported by a pilot grant from Fred & Pamela Buffett Cancer Center, University of Nebraska Medical Center (SMW), a NIH grant 1R21CA180008 (SMW), an Overseas Study Scholarship by China Scholarship Council (FX). the Charles F. and Mary C. Heider Chair in Cancer Research (HL) and by revenue from Nebraska cigarette taxes awarded to Creighton University by the Nebraska Department of Health and Human Services (HL). FX, HW, PXC, BD performed experiments, YK performed bioinformatic data analysis, CS, DB identified the subjects and prepared DNA samples, JL performed statistical analysis, KY. HL, SMW conceived the study, SMW designed the experiment and wrote the paper. All authors read and approved the final manuscript.